In addition to increased performance and expansion options, improved facilities for nondisruptive maintenance and growth provide better operational support and availability. This book provides an overview of the z9 EC and its functions, features, and associated software support. More details are offered in selected areas relevant to technical planning. 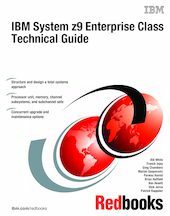 This book is intended for systems engineers, consultants, planners, and anyone wanting to understand the new IBM System z9 Enterprise Class functions and plan for their usage. It is not intended as an introduction to mainframes. Readers are expected to be generally familiar with existing System z technology and terminology.